These are the best spring rolls I've ever eaten. Finely blend or grind in a mortar, macadamia oil, ginger, galangal, turmeric, garlic, onion and macadamia nuts. Cook over low heat until aromatic and then add spices. Cook for a few minutes until you have a thick paste and then add half a can of coconut cream and half a can of water. Reduce until you have a thick sauce and season with soy, salt and more chilli if you prefer very spicy food. In a separate pan or wok sautè the vegetables and add to the sauce and pork. Heat together for 2 minutes and place in the refrigerator to cool. The mixture should be coated with sauce and not soggy and sitting in a puddle. 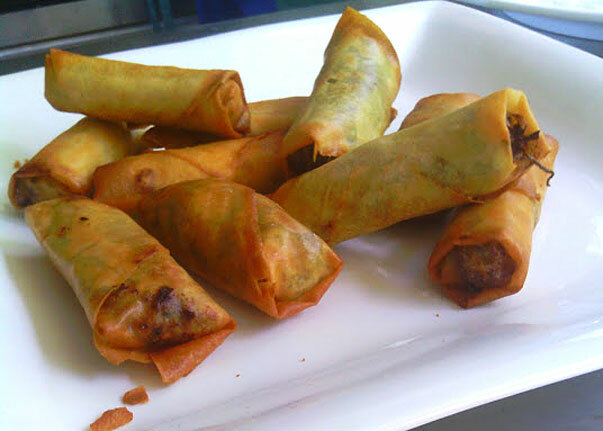 When the mixture has cooled, separate the spring roll wrappers. Place the same amount of mixture in each wrapper, roll into a cylinder and seal the ends with a paste of flour and water or use egg white. Place one in the center of the pan and cook 30 seconds and flip for another 30 seconds and then move to the sides of the wok before adding another. You can make these ahead and freeze them. Let the spring rolls thaw a bit before frying but be very gentle with them so you don't tear the wrapper. A torn wrapper makes for a big mess in the oil.